Your child’s baby teeth help your child chew and speak normally. They also hold space in the jaws for the adult teeth that come in later. Infants with good baby teeth care can help protect their teeth for years to come. A baby’s teeth start to come in when the baby is about six months old. Around age three, most children have a full set of 20 baby teeth. Spaces between the teeth are normal. Baby teeth will later fall out as your child develops and grows to make room for adult teeth, which start to come in around age six. However, not all children get the same teeth coming in at the same times. Gently rub the child’s gums with clean wet gauze, your finger or a small cool spoon. Give a clean, chilled teething ring but don’t dip it in sugar, syrup, honey or other foods. Talk to your dentist or pediatrician if your child is still cranky and uncomfortable. Don’t use gels or creams with local anesthetics (like benzocaine or lidocaine) to soothe sore gums in young children as these products may cause serious reactions in a small child. When you visit our Boulder office, ask our dentist about more baby teething care tips. Did you know that tooth decay can begin as soon as a baby’s teeth come in? That’s why baby teeth care is so important. Untreated decay in baby teeth can, in turn, lead to cavities and cause pain or infection. Get into the habit of cleaning your baby’s teeth regularly as an important step to prevent cavities. Begin cleaning the baby’s mouth during the first few days after birth. After each feeding, wipe the baby’s gums with a clean, damp gauze or washcloth. This removes plaque and particles of food that can harm new teeth and also starts getting your child into the habit of regular cleanings. When the first tooth appears, brush your baby’s teeth twice a day (morning and night) using a soft-bristled, child-sized toothbrush. Position your child so you can see into the mouth easily. You may want to sit, resting his or her head in your lap. Once your child can spit out after brushing, use a small smear of fluoride toothpaste. Begin flossing your child’s teeth when they have two teeth that touch. Clean teeth twice a day, everyday to keep bacteria away and form good habits. If a child uses a pacifier, make sure it’s cleaned at least every day. Allow your child to regularly sip water and avoid sugary liquids, like juice. Infants should never be put to bed or allowed to fall asleep with a bottle or training cup that contains milk, formula, fruit juices or any sugary liquids – water is best! 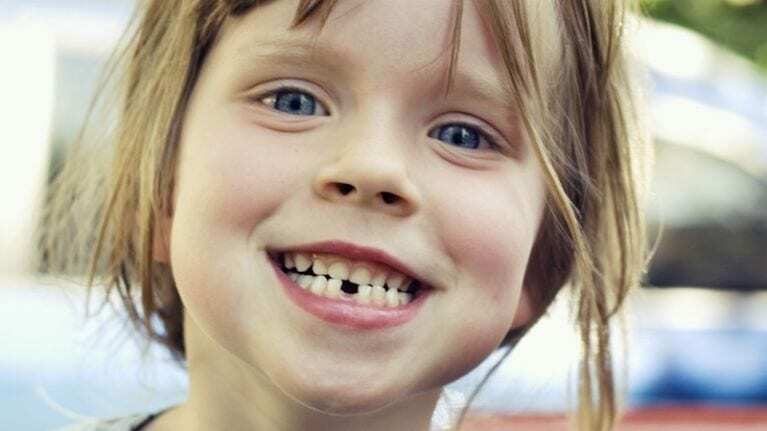 After your child’s first tooth comes in, avoid putting them to bed immediately after breastfeeding and wipe their teeth with a soft cloth first. Babies and young children shouldn’t have sugary or chewy foods that can stick to teeth. Instead, opt for healthy snacks like carrots, apples and berries. Plan on taking your child for their first dental visit within six months of the first tooth emerging or before their first birthday. Contact us to schedule that important, first checkup at our Boulder office!